The US should take note of what Japan (and China) are offering India to further relations. Indian prime minister Narendra Modi’s five-day visit to Japan was a resounding success. 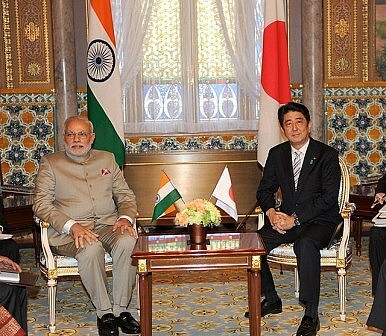 Both the Indian and Japanese press have lauded the visit and its accomplishments—notably, the elevation of the India-Japan relationship to a “special” strategic and global partnership, and the big-ticket investments in Indian infrastructure announced to the tune of U.S. $35 billion in assistance over five years. From a Washington perspective, the India-Japan relationship is a positive development and one that the United States has fully supported. What the visit also shows, however, is the way the state-directed economic policy tools countries like Japan (and China as well) are mobilizing to further their relations with India substantially exceed comparable U.S. approaches. Virtually every account of the Abe-Modi summit emphasizes the Indian interest in attracting greater foreign investment for India’s enormous development needs. Infrastructure has been a particular focus for the government of India for at least a decade, and the scale is daunting. In March 2010 for example, then-prime minister Manmohan Singh estimated that India would need to invest U.S. $1 trillion in infrastructure development by 2017. India has some way to go to meet this target. The government of Japan, with its state-directed tools of overseas development assistance (ODA) and large capacity to grant assistance in the form of soft loans, has been working closely with the government of India since 2006 on the high-profile Delhi-Mumbai Industrial Corridor, and has plans for a new collaboration in the Chennai-Bengaluru corridor. Of course there’s a clear Japanese commercial interest in this collaboration—the prospect of India adopting Japan’s bullet trains to upgrade rail travel between these cities—but that can’t fully account for a financial commitment that averages out to around $7 billion per year. It seems clear that Japan’s interests in India’s rise as a stable democracy in Asia, and supporting India’s ability to offset the growth of Chinese influence across Asia, has spurred Japan to meet Indian economic development interests with focused assistance on a large scale. The cataloguing of Indo-Japanese collaborations provided in the two countries’ recent joint statement, the “Tokyo Declaration for India-Japan Special Strategic and Global Partnership,” shows how Japan’s ODA commitment to India focuses not on primary education, or strengthening governance, or civil society—many of the important areas supported by multilateral development banks and national aid agencies—but rather on areas like “next generation infrastructure, connectivity, transport systems…manufacturing, clean energy, skill development” and others. According to the statement, Japan has just pledged a $476 million loan (50 billion yen) to develop a public-private infrastructure project in India. Japan’s approach contrasts in scale with the United States, although both support the same goals. Leaving aside the different development focus of the U.S. Agency for International Development, the American tools to enable similar kinds of infrastructure collaborations are the Export-Import Bank of the United States (Ex-Im Bank), the Overseas Private Investment Corporation (OPIC), and the U.S. Trade and Development Agency (TDA). (Ex-Im Bank helps finance U.S. goods and services exports; OPIC helps private capital address development challenges by providing risk insurance and financing; and TDA assists with feasibility studies and reverse trade missions to help U.S. companies do business in emerging markets.) India has become an increasingly important market for these economic agencies. The Ex-Im Bank has made India a large focus over the course of the last several years; in fact, according to the 2013 Ex-Im Bank annual report, India was the largest single-country portfolio for that year, with authorizations of $2.1 billion. Its cumulative exposure in India now exceeds $8 billion, second only to Mexico. OPIC has been active with India since 1971, and its cumulative commitment is $2.6 billion, in both financing and risk insurance. OPIC has become much more active with India since 2005 or so. But these numbers are far lower than what Japan is providing (again, $35 billion over five years, or around $7 billion per year). It’s also significantly lower than the offer reportedly made by China to provide a $300 billion infrastructure loan to India by 2017. By comparison, we come up short. The Ex-Im Bank and OPIC help U.S. companies do business in India and on projects which might otherwise be difficult to finance. They are able to meet the interests of countries seeking financing for important infrastructure projects, which can help advance bilateral relationships. In the U.S. political environment, this kind of economic support has become controversial, seen by many as “corporate welfare.” The U.S. Congress has not renewed the Ex-Im Bank’s charter, which is set to expire in September. As Washington works to strengthen its ties with rising powers like India, we should bear in mind what other powers are bringing to the table to advance their relationships, and recognize where we might want an enhanced, rather than diminished, ability to compete.